As part of our commitment to providing superior solutions for our customers, ITAC Services, in association with Hammar, has developed a new breed of side loader specifically designed for use within the Australian mining industry. This new side loader has been developed as a specialised lifting devise for the oil and gas and related industries. ITAC Services seeks to ensure that rigs are moved in the most effective and timely manner and is dedicated to employing only the safest possible measures in its rig movement operations. We believe that our new side loader can provide suitable lifting capabilities with improved operational and safety outcomes on a consistent basis. Comes with lifting hooks connected to grade 90 lifting chains without any coupling links which makes the chain system lighter. These hooks cannot, under any circumstances, fall out of the container corners and cannot get caught on the trailer causing damage. Comes with chain slings for handling of different types of bollards fitted to the rig. Has Hammar Safety + Load monitoring system fitted, complies with AS1418:11. This system sounds a warning at 90% lifting capacity. 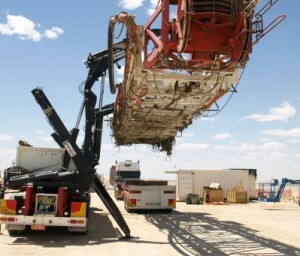 Will disable crane arms if load reaches 100% lifting capacity. Ability to program the side loader for use of counter weight to lift greater loads. Will automatically re-calibrate new lifting capacities.